For the taxonomic genus incorporating leeches, see Hirudo. The bird genus Hirundo is a group of passerines in the family Hirundinidae (swallows and martins). The genus name is Latin for a swallow. These are the typical swallows, including the widespread barn swallow. Many of this group have blue backs, red on the face and sometimes the rump or nape, and whitish or rufous underparts. With fifteen species this genus is the largest in its family. Genetic evidence has recently shown that many of the species previously included in Hirundo are less closely related than their appearance might suggest; these species are sometimes treated in the separate genera Cecropis (e.g. red-rumped swallow Cecropis daurica, previously Hirundo daurica) and Petrochelidon (e.g. cliff swallow Petrochelidon pyrrhonota, previously Hirundo pyrrhonota); they are as distinct from typical Hirundo as the house martins in the genus Delichon. All of the species are found in the Old World, although one, the barn swallow, is cosmopolitan, also occurring in the Americas. ^ Jobling, James A (2010). The Helm Dictionary of Scientific Bird Names. London: Christopher Helm. p. 193. ISBN 1408125013. ^ Gill, Frank; Donsker, David, eds. (2017). "Swallows". World Bird List Version 7.2. International Ornithologists' Union. Retrieved 2 June 2017. ^ a b Kessler, E. (2013). Neogene songbirds (Aves, Passeriformes) from Hungary. Hantkeniana Budapest 8: 37-149. ^ "Cecropis domicella - Avibase". avibase.bsc-eoc.org. Retrieved 2017-05-05. 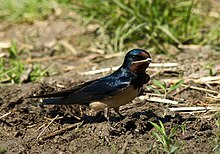 Wikimedia Commons has media related to Hirundo.